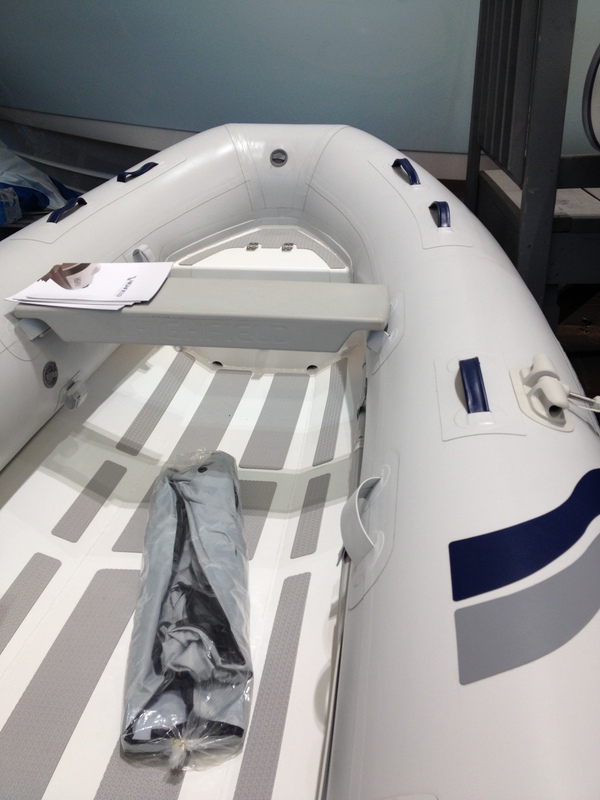 So what’s the first thing you should do when you get a new piece of equipment for the boat? A new dinghy engine, generator, power tool? The last thing any of us really want to do, take it apart. Even equipment that is designed solely for life at sea is missing one key thing, anti-seizing treatment on machine screws and bolts. This was a lesson I had learned early in my boat ownership life. When every you have metal on metal threads it can be extremely difficult to undo these items after they have existed in the salt air for sometime. 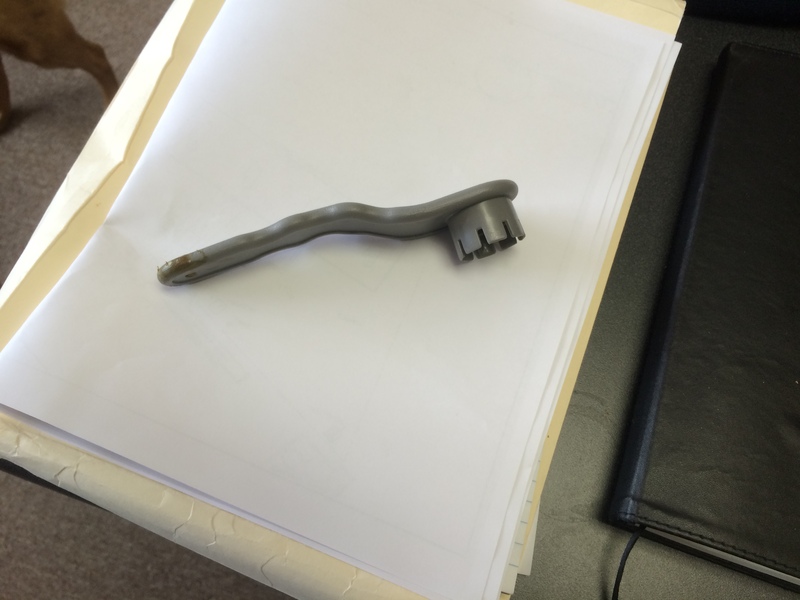 There are some easy steps you can take to deal with this, primarily by taking apart all of the bolts and using one of the many anti-seize, anti-corrosion treatments on the threads and reassembling the equipment. I have three “go-to” products for depending on the application. For stuff that will really get exposed to salt water I use Lanocote from Forespar. This works great on stuffing boxes, bolts for the outboard motor, etc. 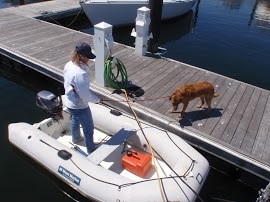 You can get it from Defender, West Marine and I have even seen it in better hardware stores. Lanocote looks like a thick grease. I use the small tub and simply dip the ends of bolts or machine screws in the tub before reassembling. For areas that are above the waterline that might get corrosion due to salt air and occasional spalsh I use Tef-Gel. I like this for reassembling stanchions, for bolting hardware into imbedded deck plates, turnbuckles, etc. This can be a little harder to find. I often order it online and have switched back and forth between the syringe and the tub. Both come with a brush that makes it easy to apply to the inside of nuts or threaded plates. For bronze, brass and plastic fittings on water systems I use Real-Tuff by Oatey. This is a teflon based thread sealant but it also helps as an anti-seizing agent. I typically use this applied over teflon tape on threaded by fittings. An example of this is when I built my own exhaust riser/mixing elbow. Recently I had two examples of why the use of these products is important. This winter I broke down my new-to-us Nissan 9.8 horsepower, 2-stroke outboard we use on our Highfields Dinghy. 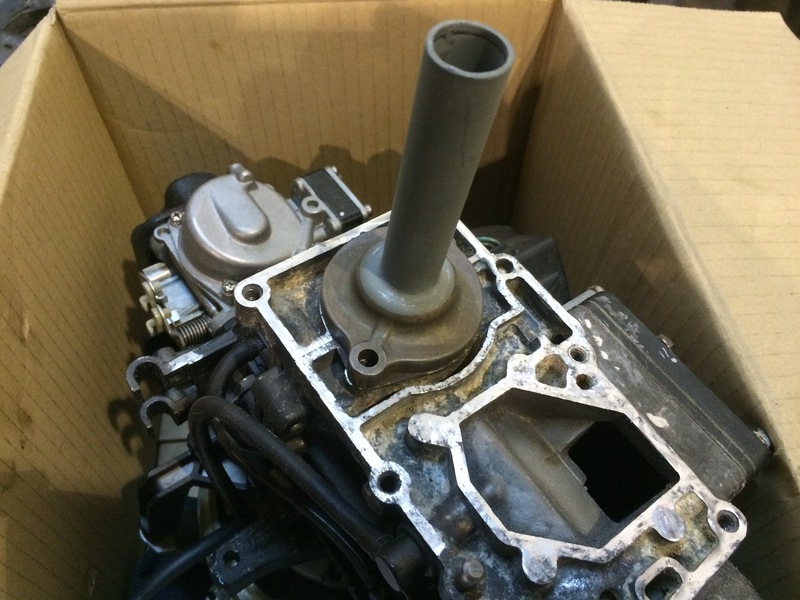 The engine is probably from the late 1980s to early 1990s. We purchased it used two years ago because it is the lightest 10 horsepower (they are really 10 horsepower and just called 9.8 or 9.9 because some inland lakes have rules that say no 10 horsepower or greater engines) you can get at just 57 pounds. I like the engine and don’t mind the age but knew I would be in for some work to get it ready for life at sea. Breaking the bolts loose on the powerhead was difficult but I was able to get them off. Once I removed the powerhead I found the tube for aligning the shaft was corroded and broke in my hand. 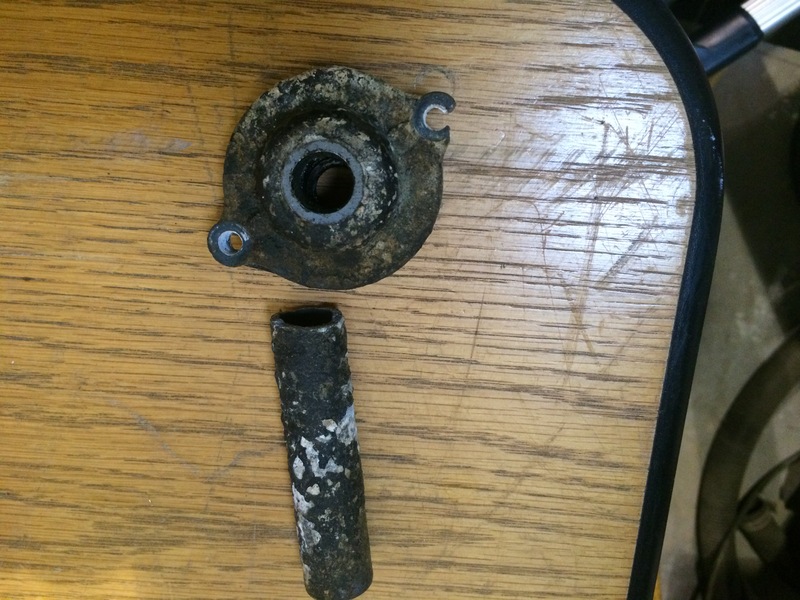 Worse yet, one of the bolts holding this onto the powerhead snapped in two with very little pressure. Thankfully I tackled this project here, before we left. If this had happened while we were out cruising I would have had to try to hand drill this out or use an “easy out” then retap. But I have a friend that works in a good machine shop (shall remain nameless since he did the repair work while on the clock). 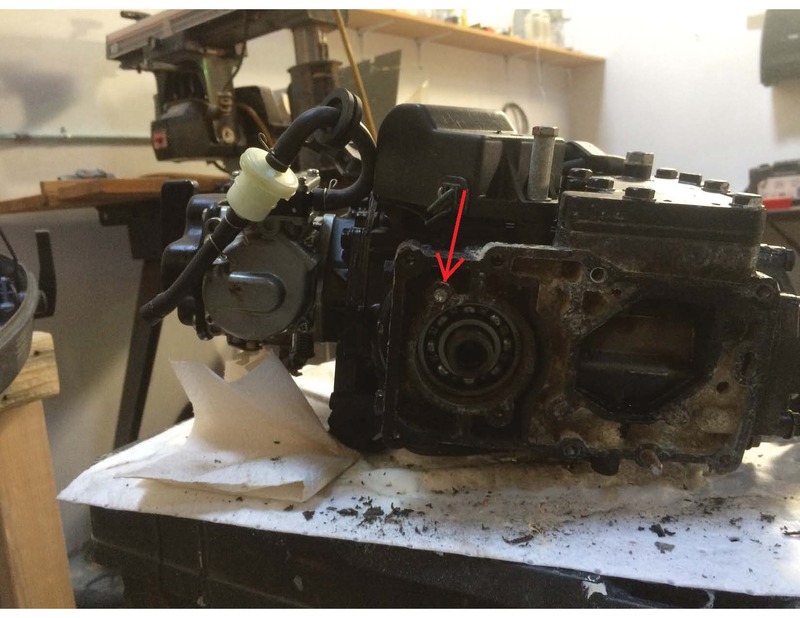 He used an “easy out” but as soon as he put pressure on the broken bolt it crack the cast aluminum engine block. Again, thankful this happened here as the same friend was able to have one of the welders repair the crack and then he was able to drill and tap the new weld using equipment they had at the shop. This repair might have been an engine ender if I had to do this using the tools available on the boat. Notice the large welded are in the upper right. It’s great to have friends that can help with specialized equipment. Might be one of the biggest things I will miss when we are gone. The friends will come and visit us in tropical locations but they won’t have their tools with them. The repair was perfect. Now I just needed to reassemble everything. I used Lanocote on all of the bolts to prevent this from being a rebeat if I have to work on the engine in the future. I also had two brass screws for the throttle assembly strip out on me that I had to drill out but those were a little easier to deal due to the softness of the material and the location. 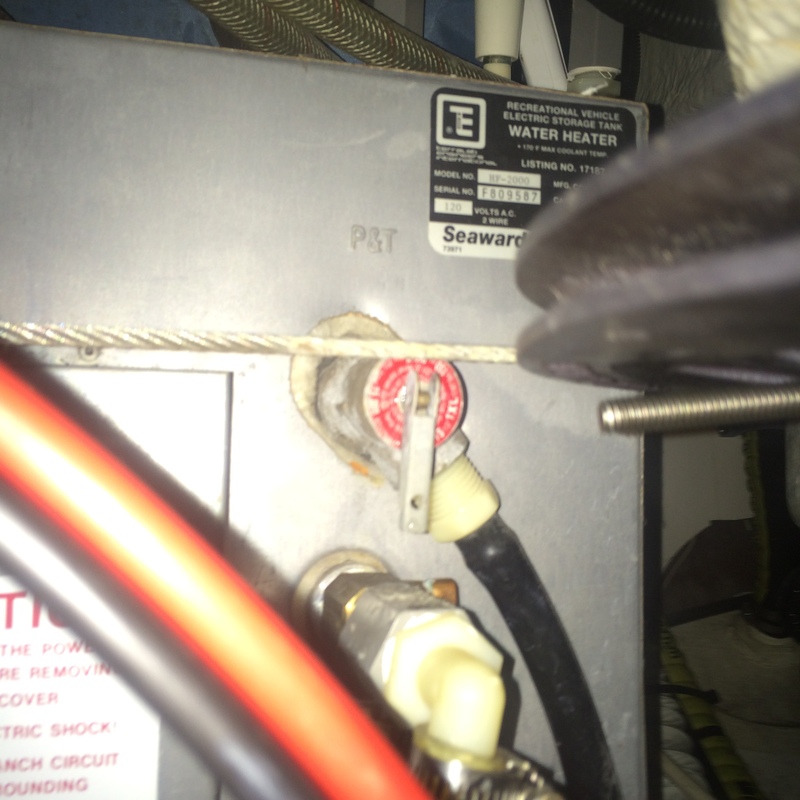 This past weekend we finally were able to tackle a leaking pressure relief valve on our water heater. I had tried to remove it last week but it would not budge. I soaked it down with PB Blaster and hoped it would be easier to get off this week. No such luck. 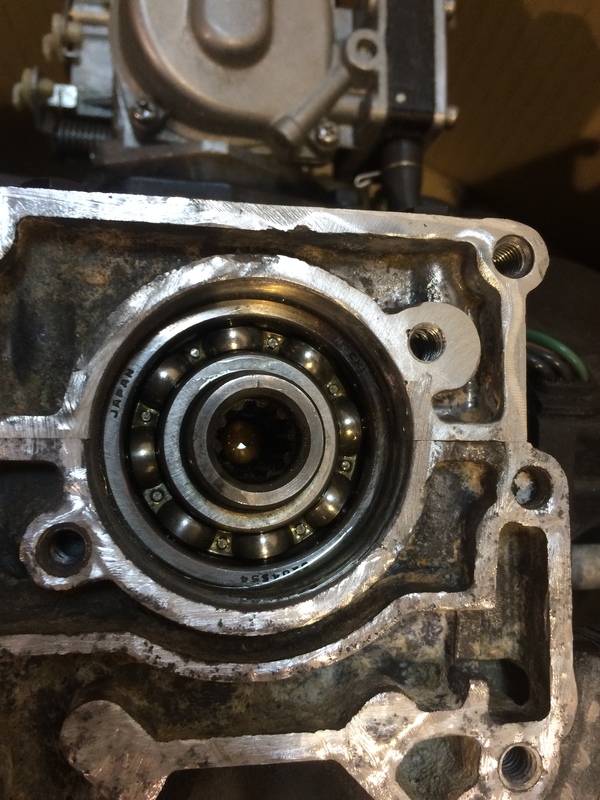 But thankfully our friend Chris was able to get in there and get enough torque on it to break it free. That didn’t mean the fun was over because once you have it moving there is still no room to work. Your working over and under the steering cables, around the throttle and shifter cables and you can’t get a full turn on anything due to other parts of the water heater or the cockpit floor only six inches above the valve. Getting the old one off and the new one on took constant back and forth of approaching it from over, then under and you had to take turns using an adjustable wrench, a pipe wrench and channel locks as they all could only grab the valve in certain locations and angles. When we go the old one off, sure enough for a drop of thread sealant or teflon tape. Treated the new valve in the usual way and we are back to using hot water. 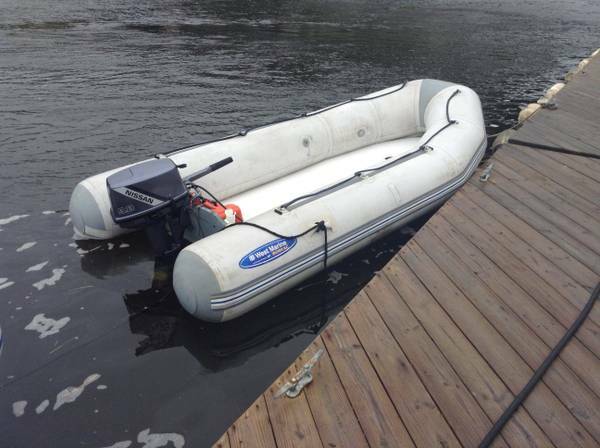 Categories: Inflatable & Outboard, Upgrades & Repairs | Permalink. No we didn’t get rid of Smitty. We love her too much for that. But we did purchase a new inflatable. We’ve been having ongoing inflatable issues ever since we have had one. Our first inflatable, named Smitty Ditty by my Bride, was a 10-foot fiberglass RIB. We got Smitty Ditty with the purchase of Smitty and that came with a 5 hp Nissan 4-stroke outboard. We very much had a love/hate relationship with Smitty Ditty. It was our first inflatable. And she did take us almost everywhere we wanted to go. 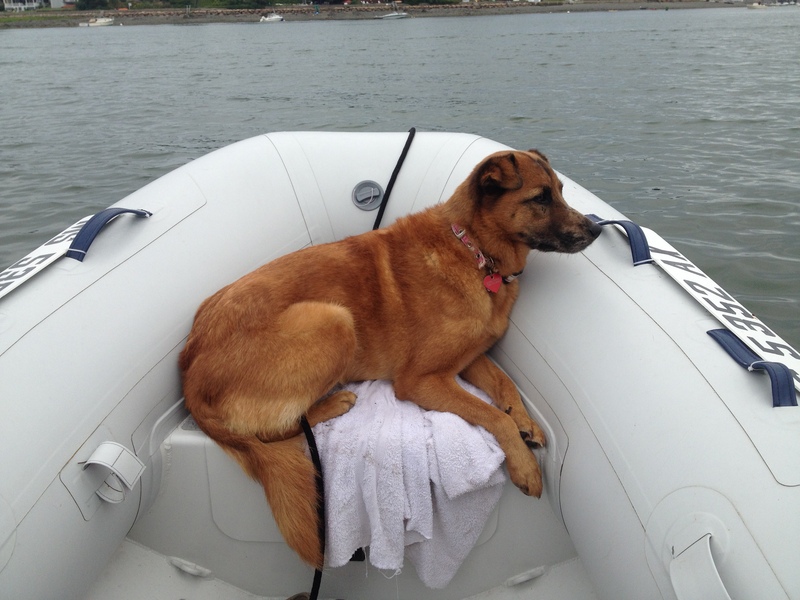 But she weighed about 140 pounds and was too big to fit on the bow inflated and not be in the way for the anchor locker. She also leaked water no matter what I did. I reglued her 3 different times with no luck. She was also having a problem holding air and had two large (over a square foot) patches on the rear of each pontoon. We purchased the Limo because we wanted the motor. Our friend Stu has the Tohatsu version of this engine (Nissans and Tohatsus of this era are the same motors with different stickers and paint). Our 5 hp 4-stroke weighs 54 pounds. This 9.8 hp 2-stroke weighs 57 pounds. Essentially we doubled our horse power for 3 pounds and the inconvenience of mixing gas. Done deal. The motor just happened to come with a 11-foot inflatable rated for 1,545 pounds. It was huge and you could easily put 6 adults and a dog in the boat. You could have a large cooler in the middle of the boat and still sit people around the outside. The party bus of dinghies. The Limo came at a good time. We put the new motor on Smitty Ditty for some test runs. By the time we made it back to the dock it was apparent that the Ditty was no longer holding air. I had just repatch one of the large patches on the back and the patch wasn’t taking. In addition, the hull was now leaking water into the area between the two hulls so it now weighed close to 200 pounds. We sold her to someone at the dock and used the Limo for the rest of last season. The Limo isn’t bad, just big. We lost close to 1.5 knots when towing it and there is no chance of having it on deck. It also has a soft bottom so beaching it to take Summer for a walk is dicey. So this year we planned to make a big purchase, a new inflatable. We didn’t want to mess around with used, patch inflatables for when we head out cruising because it will be our connection to land and all purpose vehicle. We knew we wanted a hard bottom so that Summer could stand in it with no problems and we could beach it. The length had to be 9.5 feet or less because that would fit on deck. We also wanted it to weigh as little as possible so that putting it on deck wasn’t a big deal. We also came to the conclusion that we wanted hypalon as opposed to PVC since PVC didn’t seem to last in the Caribbean sun. After weighing all these options, an aluminum RIB was high on the list. They are lighter than the fiberglass and more durable for beaching. There are several that you can get in hypalon. The only down side is the cost. AB was the prime builder we liked with 9.5 foot aluminum ribs in single floor weighing 70 pounds and double floor with a bow locker weighing 118 pounds. But these come in with hefty price tags of $3,800 and $5,300, respectively. Also, the AB aluminum hulls are painted white and the paint peels in the hot sun. So now most people are getting the hulls bear aluminum and that can get hot on a sunny day. I don’t wearing shoes and Summer doesn’t either (not that I ever tried). We had a few fiberglass RIBs we were considering too that were less money but more weight. Last September we saw the Highfields aluminum RIBs at the Newport Boat Show and thought they looked good. So when we went to the New England Boat Show this weekend we sought out the Highfields along with any other RIB at the show. After seeing the Highfields side by side with the others we were looking at we decided we really liked the boat. We purchased the Highfield Classic 290. 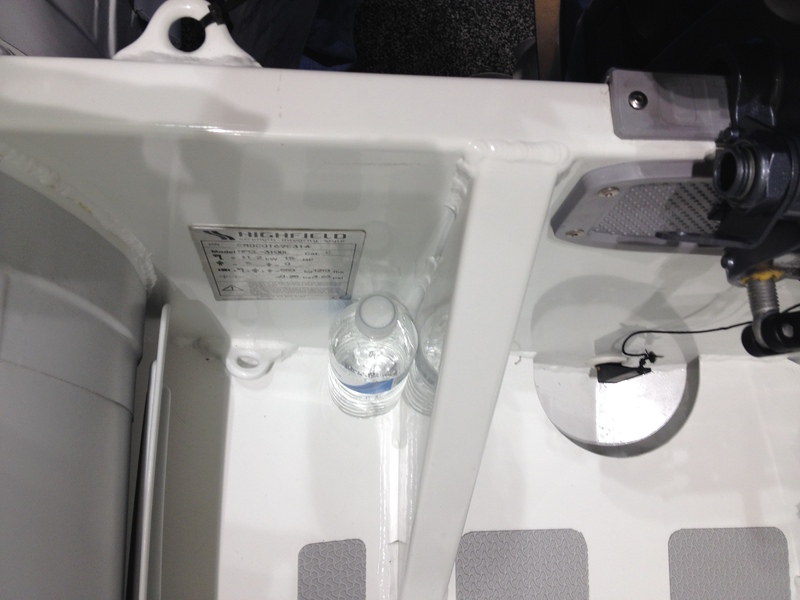 It’s a 9.5-foot double floor model with a bow locker in ORCA, a type of hypalon. The weight is 108 pounds. We decided against the single floor ultra light models for two reasons: the single floor isn’t flat and could be difficult for us and the pup to get in and out of plus stand; I have read reviews from people with really light inflatables that say they feel less safe in high winds and chop due to low weight in the bow. Highfields powder coats their aluminum hulls instead of painting them so they don’t have the same issue with flaking. We got a good deal at $3,200 with a cover, under seat storage bag, pump, patch kit and dry bag. It will be ready for us to pick it up in March. Here are some photos of the 10-foot version they had at the show. 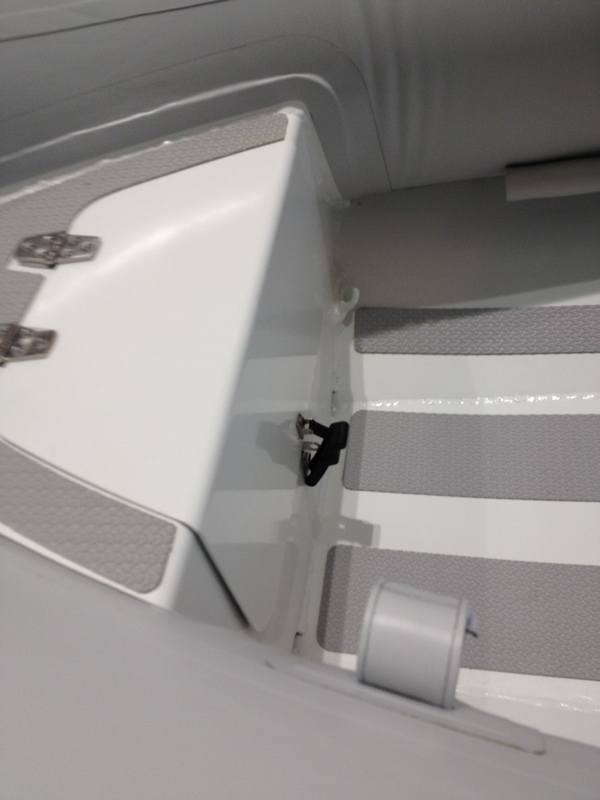 Transom support plus a bilge that reportedly will hold 10 gallons before your feet get wet. Bow locker that you can lock with a pad lock unlike the AB. No formal name yet but we (or should I say my Bride who gets to name the boat) are leaning towards Smitty Ditty II. I can’t wait to add a few key features (fuel filter, drink holder, fishing rod holder, lights for night time dingy missions) and get it out on the water. At 108 pounds our little 9.9 hp motor should get her up on plane no problem and move her along at a nice pace.